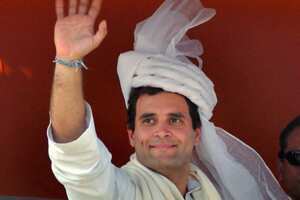 New Delhi: Rahul Gandhi on Monday threw his hat in the ring for the top job in Uttar Pradesh (UP), signalling his intent to move out of the back office in a move that could cause a stir in national politics. By making himself the face of the party in a state where the Congress is starting out behind the principal contenders, the Bahujan Samaj Party (BSP) and the Samajwadi Party (SP), Gandhi has also raised the stakes for himself and the Congress. Some analysts say the scion of the family that has called the shots in the party for at least seven decades is testing the waters to see how people respond. Others say it is a statement of political intent that signals his readiness for the top job in the state, as a sort of stepping stone to the top job in the country. Either way, it is the first time Gandhi, 41, has said something that even remotely seems to suggest a willingness to take on an elected constitutional post. The son of Congress president Sonia Gandhi has consistently rebuffed reports about his prime ministerial ambitions. He is currently in charge of the party’s youth and student wings. The time and place of Gandhi’s coming out party—if it is that—couldn’t be more symbolic. Phulpur was the constituency of his great-grandfather and India’s first prime minister Jawaharlal Nehru. Monday was Nehru’s 122nd birth anniversary. Gandhi’s move comes at a time when there is considerable speculation that he will be taking over the party’s leadership. Sonia Gandhi underwent a surgery in the US for an undisclosed illness a few months ago and the speculation is that the state of her health remains poor. Though Rahul Gandhi’s declaration could unite Congress workers in the state, one analyst said the party may have lost an opportunity because of the lateness of the move. Analysts have long believed that Gandhi could be a potential vote catcher, particularly among the young; 60% of India’s population is estimated to be under the age of 35. Political analyst N. Bhaskar Rao said Gandhi is “testing the waters" with his proposal, but added that “it does not seem to be enough to reverse the political trends in UP". “He has to come up with a clear agenda and specific programme for the state," Rao added. Another analyst said Gandhi’s move gives the Congress a real chance. Badri Narayan, a UP-based political analyst, said Gandhi’s proposal could “consolidate the anti-Mayawati votes as well as anti-incumbency votes in the state" in favour of the Congress. The Congress party’s spokesperson declined comment. The party’s daily briefing was also cancelled on Monday. At Phulpur, moving away from the party’s traditional and sober garibi hatao (remove poverty) slogans, Gandhi unleashed a tirade against the Mayawati-led BSP government in the state, indicating the Congress’ aggressive approach in India’s most populous state. He labelled the BSP’s rule “mafia rule", levelled charges of corruption against the government, cited the state’s poor development record and called for change. Alleging that consecutive non-Congress governments have not done justice to UP, he asked: “For how long will you beg in Maharashtra or work as labourers in Punjab? When are you going to change the government here? Tell me right now. I want a reply. Let all of us join hands to bring about the change." He attacked the state’s leaders too. “Till a leader does not understand the condition of the poor, till he does not go in the houses of the poor, till then he will never feel angry. Anger about the fact that what atrocities are being meted out to the poor in the state. Perhaps there was a time when Mayawati and (SP chief) Mulayam Singh Yadav had that anger, but now this anger is dead in them. They’re running behind power, they’re looking for power," Gandhi said. Mohan Singh, Rajya Sabha member and SP leader, said: “Rahul Gandhi, in the dream of becoming UP chief minister, will neither become that nor the prime minister." “This will not make any difference to the Congress’ prospects in UP. Congress over the last 30 years has dried up. It is like a dried river. It takes a lot of effort to bring it back to what it was. Just a day’s campaign is no good," he said. Both the BSP and the SP support the Congress-led United Progressive Alliance government at the Centre from outside. Narayan, a professor at the Govind Ballabh Pant Social Science Institute at Jhusi, Allahabad, added that if Gandhi becomes the Congress’ chief ministerial candidate in UP, where the infighting in the party’s state unit has been hobbling its growth, it will increase the intensity of the fight between the Congress and the BSP. “With his frequent visits, Dalits and even Jatavs (the core of Mayawati’s electoral base) have become soft on Gandhi. So if the party is projecting him as the chief minister, all those who are anti-Mayawati will come out and vote for him, but one cannot say now that whether the Congress will come to power," he said. The Congress, which won 83 of the 85 Lok Sabha seats in the state in the 1984 Lok Sabha election, was on a decline till 2009, when, inspired by Gandhi’s efforts, it won 21 seats (against nine in 2004).